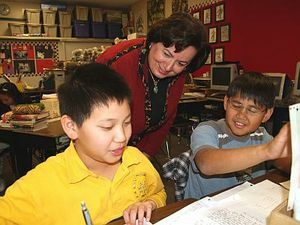 Rowland Superintendent Maria Ott works with Michael Feng and Korbin Amper at Shelyn Elementary. She is being honored today by the California Association for Bilingual Education. Ott has been named its administrator of the year. Read our story about the local superintendent in the Rowland Heights Highlander. Blandford Eementary School In Rowland Heights will hold a special Asian night today. It will begin with an Asian barbecue dinner from 5:30 p.m. to 6:30 p.m. The cost is $5 for adults and $3 for children. Activities will feature three half-hour cultural rotations from 6:30 p.m. to 8 p.m. Community leaders as well as teachers will teach origami, martial arts, Korean dance, abacus math, calligraphy, geography and Chinese zodiac lessons. At 6 p.m., there will also be a song/dance by the Chinese after-school program. The school will also be raffling school sweatshirts. Raffle tickets are $1. All proceeds go to PTA. Teens can enjoy an afternoon of video games such as Guitar Hero, Rock Band and DDR at Rowland Heights Library. The fun begins at 3:30 p.m. on Wednesday, Feb. 25. Snacks will be provided by the Friends of the Rowland Heights Library. The library is at 1850 Nogales St. For information, call Adrian Romero at (626) 912-5348. The Hacienda Heights Improvement Association will review the Draft Environmental Impact Report for the Pacific Heights project at its next meeting on Monday, Feb. 23. Project manager Elsa Trujillo and the project biologist from Pacific Communities are expected to attend. The association meets at 7 p.m. in the Hacienda La Puente Unified board room at 15959 Gale Ave. in Hacienda Heights. Helping others, that’s what it’s all about. And our schools are certainly jumping in with both feet. Bixby Elementary in Hacienda Heights participated in the “Jump for Heart,” for the American Heart Association. They were joined by the kids from Valinda Elementary who also jumped for the heart association at their campus. Palm Elementary in Hacienda Heights held a “Pennies for Patients” assembly in the cafeteria, on Friday. The kids raised money for the The Leukemia and Lymphoma Society. Kindergarten teacher Kristy Rivera reported that one student, Rudy Pedroza, raised more than $480. Amazing! Principal Edna Moore said the school wanted to raise $1,400 this year. This is the second year that Palm has raised more than $1,000 for the Leukemia and Lymphoma Society. Congratulations! The Rowland Heights Library will hold a book sale in the lobby from 10 a.m. to 4 p.m. on Saturday, Feb. 21. The sale will include children’s books, young adult books and adult books, as well as books on tape and VHS movies. The library is at 1850 Nogales St. For information, call (626) 912-5348. 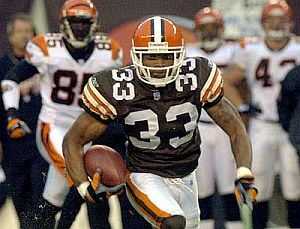 Daylon McCutcheon, former NFL player for the Cleveland Browns, will be the keynote speaker at today’s celebration of Black History Month at Nogales High School. The event begins at 6 p.m. in the school’s Little Theater. The local high school is celebrating the accomplishment’s of African-Americans. There will also be performances by singers, steppers, dancers and poets! Refreshments will be sold to raise money for ASB. We don’t want to hound parents about good hygiene, but Harold the Healthy Hound will. The playful puppet will present “How to be Healthy,” a show for parents on hygiene for children. The show is presented by Rowland Unified’s First 5 program. The hourlong puppet show begins at 9:30 a.m. on Thursday in Room 23 at Hurley Elementary School in La Puente. The show helps parents prepare their children for school from birth to age 5. The First 5 program provides resources, educational/literacy programs, child-development information, access to medical services, special needs referrals, and parent group support. Resource kits are available free of charge, in multiple languages with videos and materials to enhance the skills of parents. The First 5 Story Mobile van visits local neighborhoods, providing a variety of literacy experiences for preschool children. For more information, call (626) 854-2228. KCAT TV Channel 3 in Hacienda Heights will broadcast the last live “Marty’s Corner” show on Saturday, Feb. 21. The local television program has entertained viewers throughout Hacienda Heights for 16 years. But on March 1, the studios at KCAT will close. If you want to be a part of the last live studio audience of “Marty’s Corner,” the show begins at 8 p.m. on the Wilson High campus at 16433 Wedgeworth Dr.
Go to www.martyscornerlive.com for details and directions. Here’s your chance to ask Tony Argott, the new school police chief for the Hacienda La Puente Unified School District. Argott will present a school safety seminar for parents at 8 a.m. Tuesday in the multipurpose room of Wedgeworth Elementary School in Hacienda Heights. It will be followed by a PTA meeting. Meanwhile, parent education classes on the new laptop computers being given to district students continues at Baldwin Academy at 8:30 a.m. and 5:45 p.m. in the school cafeteria. Los Robles will also hold a PTA Meeting in its cafeteria at 6:30 p.m.